Metabolic reprograming controlling macrophage activation and function is emerging as new regulatory circuit on shaping immune responses. Generally, lipopolysaccharides (LPS)-induced pro-inflammatory activated macrophages, known as M1 macrophages, display higher glycolysis. In contrast, interleukin-4 (IL-4)-skewed anti-inflammatory activated macrophages, known as M2 macrophages, mainly rely on oxidative phosphorylation for their bioenergetic demands. Emerging evidence reveals that these metabolic preferences further fine-tune macrophage polarization process, including signaling cascades and epigenetic reprogramming. Thus, specific nutrient microenvironments may affect inflammatory responses of macrophages by intervening these metabolic machineries. 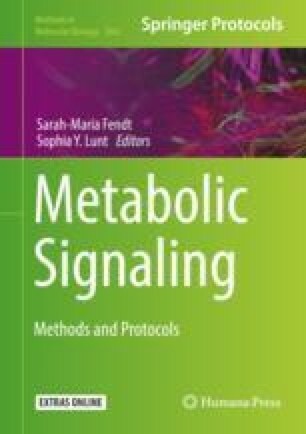 How to measure the metabolic switch of macrophages both in vitro and in vivo is an important issue for understanding immunometabolic regulations in macrophages. Here, we describe a basic protocol for examining how glutamine metabolism affects macrophage polarization by using the Extracellular Flux (XF(e)96) Analyzer (Seahorse Bioscience), which takes real-time measurements of oxidative phosphorylation and glycolysis. We also present a detailed procedure for detecting the expression of inflammatory genes in polarized macrophages under glutamine-replete or -deprived conditions.